Here&apos;s a shining idea. How about building that ideal, near perfect, long range or coastal cruising motorboat out of aluminum? Bare-naked aluminum. It would be the ultimate low-maintenance boat. Aluminum does not rust like steel or leak and rot like wood. It does not absorb water like fiberglass and it never gets the pox on its bottom. It never needs varnish or wax, or even paint (except on underwater parts). Hit a rock with an aluminum boat and the boat will simply rebound. Naked aluminum is not necessarily pretty. Teak with 10 coats of varnish and glistening fiberglass do look yachtier, and typically set the standards by which cruising boats are judged. But owning an aluminum craft will give a boater weeks of additional cruising every year-weeks that a wood or fiberglass boat will spend in the yard or stay in a moorage while workers (or the owners) sand, paint, varnish and buff. There is no question that aluminum is an expensive building material, but it can be cut with carpenter&apos;s tools and skilled workers weld it quickly. While building with aluminum may not be any more expensive than steel or fiberglass for a oneoff, custom design, it can&apos;t compete in cost with mass produced fiberglass boats, those popped from the same mold on a production floor. However, over a long lifetime of use, an unpainted aluminum boat will ultimately cost significantly less to maintain than either a steel or fiberglass vessel. It may also have the highest resale value. While an aluminum boat may indeed be industrial-looking on the outside, it can be as posh inside as the owners want, or can afford. There&apos;s no reason why it can&apos;t have furniture of teak or other exotic woods, parquet flooring or ankle deep carpeting, a comfortably-finished master stateroom and lavish use of marble in the heads. A great idea? Well, you won&apos;t be the first to build one. Tim and Marilyn Fleming of Billings, Mont., more than likely have that honor. Nearly everyone who does any long distance cruising spends his or her time on watch mentally designing the "ideal" boat. Robert Beebe did just that while serving as navigator aboard a World War II aircraft carrier, and the whole notion of passagemaking in powerboats was born. From his dreaming came Passagemaker, a 50- foot ocean cruising yacht launched in 1963 and still in service. Today, many boaters believe the ideal design for extended cruising will be similar in many ways: It will be 40 to 50 feet long and have a raised pilot house. There will be a single engine in its belly, and a bow thruster out front (that would have been alien to Beebe, no doubt). This ideal boat will have two staterooms, each with head and shower, so the owners may cruise comfortably with friends while maintaining privacy. The boat will have a touch more speed, perhaps 10/12 knots, so its designer will draw lines for a semi-displacement hull. The dream boat probably will have a cruising range of 1,000 miles between fueling stops, considerably less than Beebe&apos;s Passagemaker. It will have no trouble punching safely through sloppy seas and ocean swells. And, not least by any means, it will be a lowmaintenance boat. No paint, no varnish, no brightwork. We want to spend time boating, not sanding, brushing and fussing. 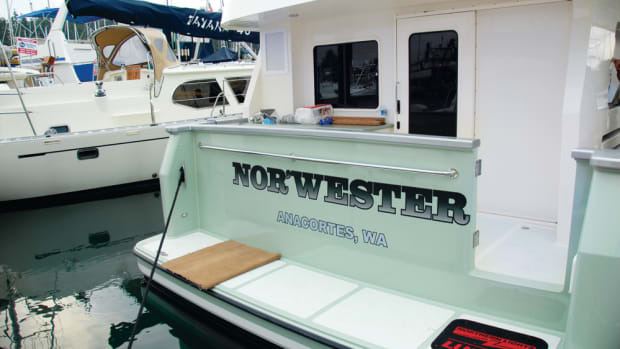 The Flemings had most of those objectives in mind a couple of years ago when they began looking for a powerboat in which to cruise and to fish seriously in Southeast Alaska, after years of sailing a 38-foot Hans Christian sailboat. "We spent two years trying to decide what to do," Fleming said. "We looked at everything. We wanted to fish and none was set up for fishing. "We were afraid we would scratch the gel coat on a fiberglass boat, so we decided on aluminum and looked for a workboat to refurbish." Rebuilding proved infeasible, so they chose to build. "We decided it would be a fishing boat on the outside and a yacht inside," he said. Their dream boat is 40 feet long by 14 feet wide. It has a combined helm/saloon, and there are two comfortable and nicely furnished staterooms with heads and showers. A single engine produces a comfortable cruising speed of 13 knots (at 10 gallons per hour), and a top speed of 16 knots (at 22 gph). It has an 8-inch electric bow thruster. The only paint is on the bottom and at the water line. Red vinyl stripes along the sheer accent the gray metal hull. Marilyn Ann is stout and ready for almost any weather found in Alaska. For the Flemings, the ghostly gray hull is their ideal yacht. Something much like her could be the yacht of choice for other boaters as well. Marilyn Ann was built by Rozema Boat Works of Bay View, Wash., about 70 miles north of Seattle. Founded in 1955 by Al Rozema, a former Dutch ship builder, the yard has built fishing boats, tugs, fire boats, police launches, oil skimmers and other commercial craft out of wood, aluminum and steel. The builder is based in a century-old meeting hall on the east shore of Padilla Bay. Al&apos;s son, Clarence, and grandsons, Dirk and Jason, continue the family business. But they no longer build boats with wood, as they&apos;ve focused on steel and aluminum construction since the early 1970s. The Flemings saw Rozema-built workboats in Alaska, and they liked what they saw. Later, they came to appreciate the Rozemas&apos; ability to work from verbal concepts. Other yards they visited demanded detailed drawings and specifications lists, Tim Fleming recalls, and lacked the flexibility of the boat-building, father-and-sons team. Dirk Rozema sketched lines for a boat as he talked with Tim and Marilyn in his office, on the second floor of the historic hall. That special attention, plus the quality of Rozema work they had seen, made it easy for the Flemings to sign a contract with the small builder. "We realized this was a family that could do anything," Tim Fleming said. "We loved their attitude. They were willing to build what we wanted. "It was built as a boat you can cruise in and enjoy being on, but it is a working boat," he added. And so the Marilyn Ann became the first boat built in the Bay View yard for pleasure use. After the Fleming yacht rolled out the door and into the bay in May, 1999, the Rozemas returned to their bread-and-butter work: a pair of steel tug boats for line handling at the oil tanker terminal in Valdez, Alaska. After them, the builders would begin construction of a 46- foot fishing boat and a 54-foot university research vessel. The Rozemas are aware of the growing market for cruising powerboats, and hope to build more pleasure boats of aluminum and steel. Would-be customers began calling after the Flemings took Marilyn Ann to Petersburg and Sitka, and other dreamers saw her under way or at a moorage closer to home. I first saw her in Petersburg, Alaska, where aluminum and steel fishing boats are a common sight. But her yacht-style superstructure, her naked hull and imposing, wave-crushing bow drew a procession of gawkers down the float. My first thought was: this is a candidate for the ideal cruising boat list. She drew more attention when the Flemings took her to her summer port of Sitka, and then began cruising and fishing commercially during ten-day breaks from his medical practice in Montana. Aluminum is a common boat-building material in the Pacific Northwest and Alaska. Hundreds, if not thousands, of sport fishing and commercial craft, from 10-foot rigid-bottom dinghies with flotation tubes to 30-foot crew boats, all built of unpainted welded aluminum, work and play throughout the region. They are sturdy, fast and never need paint, varnish or wax. Just hose the salt off occasionally. Dozens of builders in the Northwest cut aluminum, weld it, and push sport and work boats out the door to satisfy the market demand for maintenance-free craft that can be banged and bumped without serious damage. At the other end of the yacht spectrum are the superyachts built by Palmer Johnson in Wisconsin. They, too, are made of aluminum. But yard crews spend months fairing and preparing each hull for paint and the vessels all have prices seven or eight digits long. As an aluminum cruising yacht, Marilyn Ann is unusual in the Pacific Northwest and Alaska. She turns heads wherever she goes because of her appealing, but stout, yacht lines and her gray metal hull and superstructure. Dirk Rozema believes Marilyn Ann is the first of a wave of unpainted aluminum pleasure boats, and is confident his family business will skim a fair share of one-off designs and adaptations of existing workboat plans. He dreams of building a yacht on the hull of the line-handling tugs launched for work in Valdez. They are the first true displacement boats built by Rozema. I&apos;ve not seen anything like Marilyn Ann in a couple of decades of boating. Undoubtedly, there are some like her in service somewhere. Up to now, there has been no rush to build cruising yachts using unpainted aluminum, probably because it has a decidedly nontraditional and industrial look. But the benefits of a strong, enduring material requiring no costly maintenance program may swing public views to aluminum, particularly for custom designs. Another Builder Among other yards ready to do one-off aluminum yachts is Kvichak Marine Industries, which operates out of a large building on the Lake Washington Ship Canal in Seattle. I dropped in to survey aluminum building techniques, just as the Kvichak crew was preparing to push a new 64-foot catamaran out the door for launching in the canal. It will carry about 150 passengers on day cruises in Hawaii. The hull of the cat had been painted bright red, and the superstructure a bright white. Her size and brilliant colors make the cat a dramatic vessel. Close up, it was possible to see the "print through" of the frames in the aluminum skin. But in the water, it would pass the 50-foot test (does it look great at that distance?) with ease. A couple of other 50-foot-plus unpainted catamarans were under construction, one to carry passengers, and the other for a fisheries enforcement agency. Nearby, U.S. Navy utility boats were being assembled. "If anyone wants a pleasure boat, sure we&apos;ll do it," said Jim Meckley, production manager. "We are in the custom boat business." Meckley said Kvichak can compete, dollarfor- dollar, with a one-off fiberglass yacht. He showed me a photograph of a large, flatbottomed fishing skiff that had accidentally been run onto rocks at high speed. The outboard motors were damaged, but the skiff was hauled off with the tide and went back to work fishing. When the off season came, the vessel was returned to Kvichak for $10,000 worth of bottom repairs. A fiberglass boat would have been a total loss. "It&apos;s light and strong," he said in praise of the gray metal. "I think we can build a great yacht." What&apos;s the best thing about being in a yard producing aluminum boats? The place smells good. No odor of resin lingering in your nose, hair, and clothing, no fiberglass dust in the air. 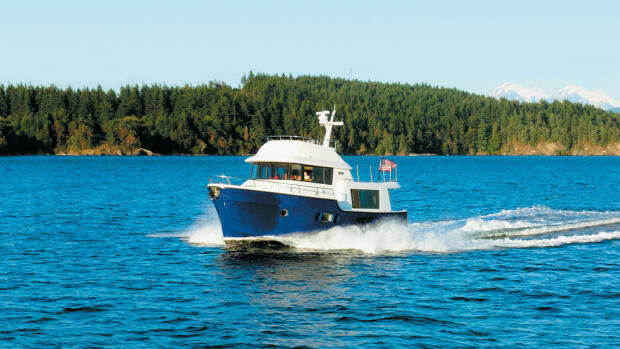 Michael Kasten, a naval architect in Port Townsend, Washington, is an advocate of aluminum and steel, and two tug yachts of his design (31 and 38 feet) are under construction. Kasten is also editor of Metal Boat Quarterly, the publication of the Metal Boat Society. When asked why someone should consider building an aluminum boat, he had an answer, of course. "For things that go bump in the night. For ease of construction. For longevity. For good resale value. "For the benefit of being able to create a custom design and built it economically, without the huge penalty of having to build a mold first, as with fiberglass. "For freedom from fiberglass boat pox. For repair-ability. For lightness and strength. For the security of safe cruising." Aluminum for a boat hull costs about twice as much per pound as steel. Fewer pounds of aluminum are needed, however, and it is faster to fabricate and weld than steel, partly because it can be cut with carbide carpentry tools. That means aluminum can compete in dollars with steel in boat production. Because an all-aluminum boat weighs less, it can also carry more fuel or cargo. Computer design programs and NC (numerically controlled) cutting systems simplify lofting, or shaping, of hull plates and structural framing for new, custom designs. Engineers and builders can modify existing hull designs to satisfy customers&apos; needs, again using computer-aided design systems. "It&apos;s easy to change the size and still have an accurately engineered boat," Dirk Rozema told me. That&apos;s precisely the way the Fleming boat was born. A stock 46-foot by 16-foot Rozema fishing boat hull was trimmed down to 40 feet by 14 feet with the aid of a consulting marine engineer. The Flemings originally wanted a 36- foot boat, but the Rozemas determined it would take another four feet to accommodate everything they wanted. "We took the 46, took her lines and compressed them, then we faired the bottom some," Dirk explained. "She&apos;s only a little smaller." 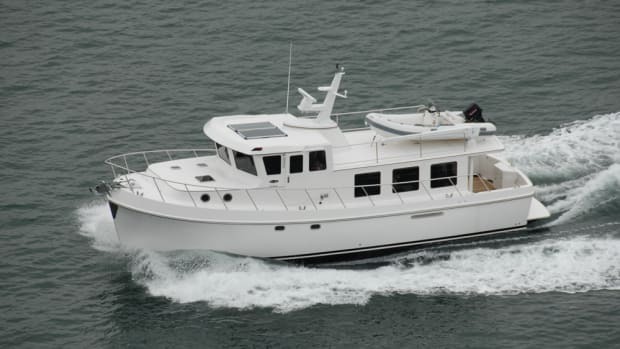 Rozema refashioned and enlarged a traditional Rozema pilothouse, with reverseraked windscreens, and increased the living spaces to meet Fleming requirements. The hull plates (1/4-inch thick) and structural framing members were plasma cut by another firm from marine grade aluminum and delivered to the Rozema yard, where workers welded them together. The yard crew built the superstructure for the yacht (from 3/16-inch plate), and all the fittings, rails and accessories that she would need. Rozema workers then installed the single, 450 hp Cummins diesel, a 5kW Northern Lights generator, and other equipment. Carpenters finished the interior using cherry wood for cabinets, furniture and trim. The pilothouse sole is surfaced with strips of cherry and yellow cedar. A new aluminum boat has mirror-like finish that glistens in the sun. But after several months of exposure to the sea, rain and air, the shine is replaced by an aluminum oxide coating, and the hull and house develop a soft, mottled-gray appearance. Dirk Rozema told me painting a boat like Marilyn Ann would add $15,000/$20,000 to the base price of about $360,000. Rozema hulls are fair and clean because of good construction techniques (they don&apos;t have the "hungry dog" look caused by warping of plates between frames, he said), so they look good painted without extensive prep work. Eventually, painted boats need to be repainted. And the cost is high. If the aluminum is left unpainted, the owner&apos;s only cost for exterior maintenance would be for a hose, a bucket and maybe a little soapy water occasionally. Aluminum is a good conductor, so it transmits cold and heat, noise and vibration, forcing builders to take special care during construction to eliminate or reduce those annoyances. Aluminum must also be protected from direct contact with other metals, to prevent galvanic corrosion. Marilyn Ann&apos;s inner hull is lined with 3/4-inch insulation that provides R15 protection and eliminates possible condensation on the metal surfaces. The superstructure walls are insulated with 1/2-inch foam panels. The engine room is lined with the usual lead/foam sound-absorbing material. Beneath it is a sheet of 1/8-inch vinyl that Dirk Rozema says helps minimize harmonic vibrations. The exhaust system is isolated from the hull by the use of heat-resistant rubber saddles, which reduce rumbling and vibration from the Cummins diesel. Most workboats of a similar size would have a dry stack exhaust, but Marilyn Ann has a wet exhaust system because it is quieter. Together, the insulation and isolation equipment provide a "significant" reduction in boat noise, according to Dirk Rozema. The bottom of Marilyn Ann is painted with three coats of primer, and a top coat of antifouling paint. Sacrificial zincs are used to prevent galvanic corrosion between the stainless steel shaft, bronze propeller and aluminum hull. Stainless steel bushings isolate bronze through-hull fittings and the boat&apos;s keel cooler from the aluminum plate of the hull. If dissimilar metals are used during construction (it&apos;s not uncommon to see a boat with a steel hull and aluminum superstructure), they are separated by an "explosion-fused" bimetal strip developed by DuPont, called Detacouple® or Detaclad®. The steel side of the Detacouple® strip is welded to the vessel&apos;s steel structure, and aluminum components or structures are then attached to the aluminum side of the strip. The unique properties of the Detacouple® bond keep the dissimilar metals isolated from one another. Michael Kasten&apos;s newest tug yacht, the 38- foot Nidaros, will have a steel hull and aluminum superstructure. Let&apos;s go aboard Marilyn Ann. Remember that Tim and Marilyn Fleming are keen fishing people. They have an Alaska handtroll permit for salmon fishing (they were fishing commercially only weeks after the boat was launched). Needless to say, their boat has more fishing gear on it than normally would be found on a yacht. "We are not spectators," Tim Fleming said, explaining their passion for fishing, and being active during 10-day breaks from his medical practice as a heart specialist. "We like to do something." She carries paravane stabilizers that are used mostly while trolling at slow speed, or at anchor in an open harbor, to reduce rolling. From the 36-inch-deep boarding platform, step through a transom gate into the cockpit. It is 4&apos; 9"-deep and runs the full width of the boat-large enough for sport or commercial fishing, or for lounging in the afternoon sun. One door leads to the aft stateroom, and a second is for a hanging locker for foul weather gear. Side decks are 19 inches wide and lead forward from the aft cockpit to the foredeck. The bulwarks along the side decks are about 34 inches high, offering plenty of protection while walking forward. On the foredeck, however, the bulwarks are only about 12 inches high, so it would be an unsafe place to be in rough water, despite grab rails along the top of the trunk cabin. But there&apos;s little reason to be on a trawler&apos;s foredeck in bad weather, as it is generally used only for anchoring or line handling while docking. A locking, watertight hatch opens in the center of the cockpit to reveal a general storage area. There are fish holds port and starboard, capable of storing about 600 fish on ice. Owners not interested in commercial fishing could use the same space for storage of cruising gear. The Flemings added a pipe-and-canvas cover over the cockpit for protection from bad weather while fishing. It would work well for non-fishing owners as well. Marilyn Ann has three control stations: at the main helm, on the flying bridge, and one in the aft cockpit that allows them to maneuver the boat with engine and bow thruster while fishing or when docking. A five-step ladder-its treads are wood, the only wood on the outside of the boat-leads up to two levels of deck. The Flemings have a large freezer and a liferaft on the first deck, space which could also be used for storing the dinghy. A hydraulic boom is there for hoisting. The vanes of the flopperstopper system are stored here as well. Three more ladder steps lead to the flying bridge. Looking up, the view is dominated by the radar mast, the paravane poles, an EPIRB, and navigation lights and antennas. There is a complete steering station. The galley, a settee and the helm share space in the midships area of the boat. It is finished with cherry cabinets and trim. Marilyn Ann&apos;s fishing boat heritage is obvious here. It is compact, measuring 8&apos; 4" by 9&apos; 4", and the arrangement of helm, dining table, and galley are very similar to layouts on working boats. But the cherry-and-cedar sole, cherry cabinets and trim, and Ultrasuede upholstery are yacht quality. She has a two-burner propane stove with oven, and a microwave on the aft bulkhead. A Norcold refrigerator is located beneath the helm seat. The boat&apos;s settee can seat four people, but the galley itself clearly has only enough space for a single cook. The helm seat is on the starboard side, just forward of a stout, Diamond Sea-Glaze sliding aluminum door. Depth sounder, radar and radios are suspended from the overhead, all easily seen and reached by the person at the wheel. The flat area between the helm and the windscreen is covered with a black fabric, to eliminate bothersome reflections. A teak chart holder also hangs from the overhead, next to the helm. Down four steps forward is the master stateroom, with an island queen bed and a head with shower. The insulated aluminum skin of the boat is hidden behind varnished strips of cherry wood. A skylight and ports provide plenty of light. Aft of the saloon and down four steps is a guest stateroom, also with shower and head. Steps lead up from this stateroom onto the cockpit. The engine room glistens, because the big turbocharged Cummins engine is bright white, and all light reflects from the foil-faced acoustical insulation. The engine space is beneath the saloon and is reached through a hatch next to the helm station. A hefty grab bar makes going below easy and safe. There is enough room for a small workbench with a tiny seat, the boat&apos;s generator, a Webasto furnace, tanks that hold gray water and sewage, and the hydraulic system. To avoid staining the hull, furnace exhaust (contained in an oversized pipe) goes up through the overhead and into the radar mast for discharge. The Northern Lights genset powers the 18- GPH watermaker, which is turned on every other day for a couple of hours. A small heat exchanger warms 45-degree Pacific Ocean sea water up to 60 degrees, which improves the watermaker&apos;s efficiency. The Flemings often cruise and fish for four or five days without stopping at some port, and the watermaker provides all the water they need for showers and galley use. Marilyn Ann-or something very much like her-deserves a space on the "ideal yacht" list. In many ways, her features closely match the desires of a lot of cruising couples: a strong, seaworthy boat with good accommodations, equipped with reliable machinery and comfortable furnishings. It is a boat that can cruise for weeks without touching a major port. She is probably more of a fishing boat than most yachters would want. Every boat is a compromise and Marilyn Ann is the product of compromise, too. 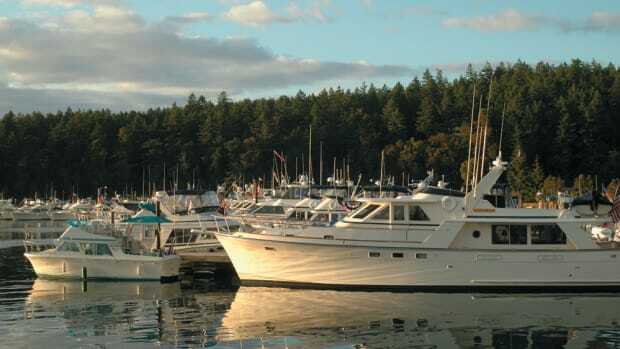 Another two or three feet in length would allow for more living space in the helm/saloon area, but that would mean a larger yard bill at the end of construction, as well as higher charges for moorage, insurance and operation. Her owners, who intend to be on deck working and fishing as much as possible, find a large saloon unnecessary. Space devoted to lounging, cooking and dining is not their primary goal. Clearly, Marilyn Ann proves that aluminum can be used to make a strong and appealing yacht that is economical to own and operate. 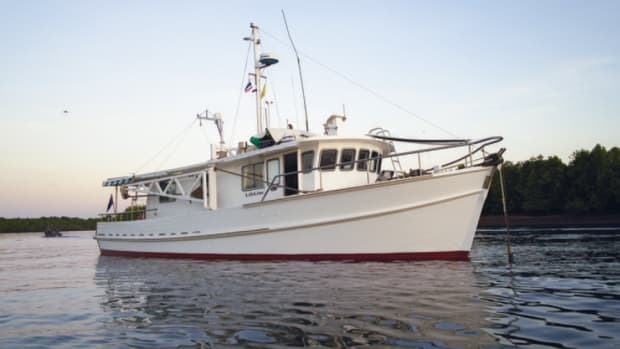 It would take only a few changes to shed her fishing boat characteristics, resulting in a comfortable family cruiser. The nice thing about boat building is that either choice is okay, and a competent yard can build it either way. You can even have it painted, too, if you happen to be one who doesn&apos;t care for the sight of naked aluminum. Last fall, the Flemings returned their boat to Seattle from Sitka for the winter. They had only 10 days for the trip, so they pushed hard-not worrying a lot about weather, the sea or some of the rapids they had to cross along the route home. Marilyn Ann ran at a steady 13 knots all the way, and they pulled into their moorage at Fishermen&apos;s Terminal right on schedule. Next summer, after some minor tweaking at Rozema Boat Works, (a bookshelf in the second stateroom is a head-knocker and must be moved, among other things), Marilyn Ann will turn north again. The Flemings will continue fishing, exploring, cruising and just having fun in their aluminum yacht/fishing boat for another season.